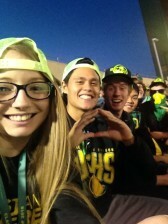 Duck Family Day is a new feature we share every Saturday, where Oregon fans share their stories of being Oregon fans! 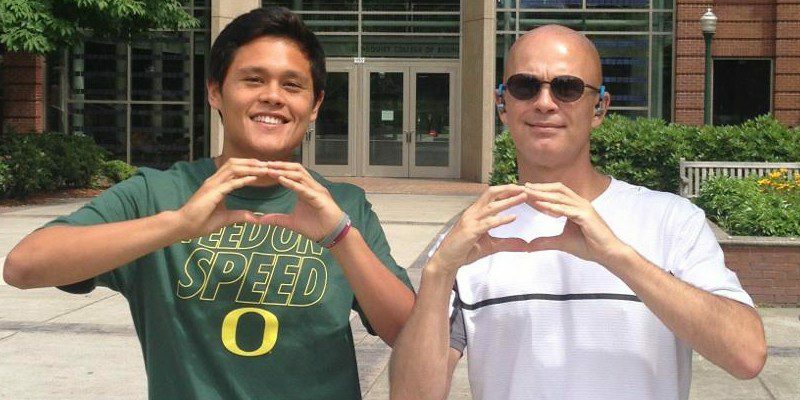 Email charles@fishduck.com to share your experiences and what it means to be a Duck fan. Austin Willholft was a writer and now the Director of Social Media for FishDuck.com and is extremely passionate about our beloved Ducks, the same as you. Contact us and share! I never thought I would be attending the University of Oregon or any school outside the confines of my home in Laguna Beach, CA. My dad’s side of the family was all local Oregonians who lived throughout the state, while my mom’s side was from Taiwan and Hawaii. Because of this, both sides had varying opinions on where I should attend school, especially my mom’s side. My freshman year in a nutshell: Tons of smiles and laughter with fantastic people. I was born and raised in a mix of Chinese and Japanese cultures where you’re taught that academics is the key to success in life. While in American culture, you’re taught almost the opposite. It’s encouraged that you should play sports or find a hobby that you’re passionate about. Is this to say that my father’s side of the family never pushed me in school? Of course not! If anything, the Willhoft side of the family instilled within me a work ethic that has helped me throughout my life. The funny thing is that academics didn’t influence my decision of where I wanted to attend college — it was more of trying something new and getting out of Laguna. Even though my hometown has beautiful beaches and magnificent sunsets, the social bubble was too much for me to handle because it is based on whether you fit the mold of certain cliques of people. Evidently, I didn’t fit the social circle in Laguna and because of that, one can say that I had a pretty rough life there. Eventually, there was a voice within me that yelled, “Get out of Laguna and explore the world!” So, that’s what I did. During my freshman year at Oregon, I met tons of amazing individuals and shared millions of laughs with those who became close friends. So, it’s safe to say that coming to the Pacific Northwest was one of the best decisions in my life. The difference in personalities and attitudes I witness in people is remarkable to say the least. Meeting individuals from states such as Oregon, Illinois, Alabama, Alaska, and Colorado is something I’ll never forget. When anyone asks me, “Should I go out-of-state?” I tend to chuckle because I recall being in their position. My answer to them is, “Do what your heart tells you, not your family.” Because my dad’s family are all Ducks, my decision to attend Oregon was easy — but on a personal note, I wanted the freedom and happiness I never experienced in Laguna. I desired the feeling of waking up every morning with a smile on my face. You have to honestly look into your heart and ask yourself if you’re comfortable with your situation. If you’re not, consider an out-of-state school that will put you in a position to best achieve your life’s goal and most importantly, make you happy to be there.